Breaking Up….Is Great to Do! 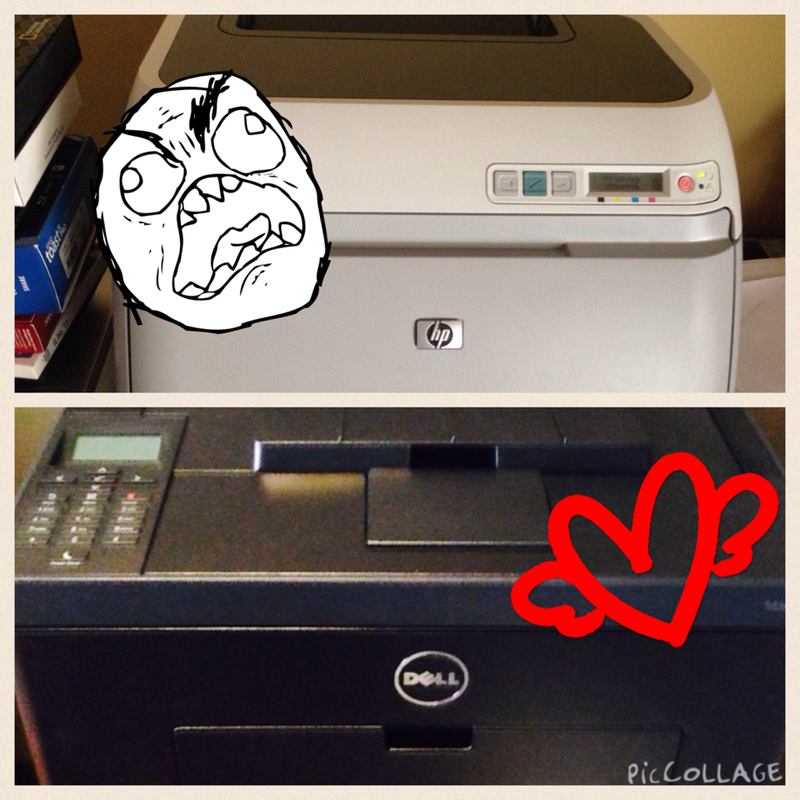 Last week my husband bought me a new Dell printer, making me ridiculously happy. I had no idea an inanimate object could bring me such joy. I find myself smiling at it, even singing to it, “You’ve Made Me So Very Happy”, “So Happy Together”, “You Light up My Life.” The Era of Good Feelings has once again come to my home-den-office. My devotion to my new Dell is best understood by my dysfunctional, at times abusive, relationship with my ex, an HP. For over two years, since I retired and became wholly dependent on our home office equipment, I was victim to the dark moods and spiteful whims of this evil HP. It wasn’t that it didn’t print – it just didn’t print consistently. It was always slow as molasses. But at times, it would grow inexplicably temperamental and stop functioning, usually when I was rushed or needed to print something important. Other times, it would print, but the colors would be whacky. Or, it would suddenly stop printing PDFs, or pages from the Web, or any number of other programs it would single out for punishment. Then the next day, all would be operational. It felt like it was playing me for laughs. My husband has a higher threshold for this type of inconvenience than I do, mainly because he is responsible for fixing things and he didn’t know how to fix this thing. Since the HP did work sometimes, it never qualified as “broken” so he was not in favor of buying a new printer. And, most maddeningly, that little stinker would print just fine for his computer (which sat next to and connected to the HP). So, we resorted to increasingly irritating work-arounds, like me emailing documents to my husband to print from my his computer, turning the printer off and counting for 60 seconds and turning it back on, and (my favorite), smacking it on the side. After days of stomping back and forth between the den and the printer, turning it on and off, on and off, on and off, cussing and yelling at the HP, my husband would calmly say things like, “Hmmm, maybe I need to take it apart and fix it.” And I ‘d say, “Or maybe I need to take it apart and kill it.”. One day I came home and my husband was doing printer brain surgery. He had hundreds of little parts spread all over the kitchen island. He had my late father’s loops (the magnifying lenses my dad used in his dentistry practice) on his head and an extra bright office light trained on the patient. The surgery was temporarily successful, and the printer worked like a champ for a few months. UNTIL, last spring, as I was preparing for my son’s USNA graduation week and planned to produce packets (including schedules, maps, and nametags) for all our guests. After spending countless hours designing, drafting and collecting materials on my computer, I began printing. The HP-from-Hell would print five of something, and then stop. Or one of something else, then stop. Then no more that day. It just refused, flagrant acts of insubordination. The next day, it would print three more of something and nothing of the other. There was one PDF that it never printed correctly. And all this after trying all the work-arounds – the turning on and off and emailing and smacking. I was mostly alone in the house those days and the swear words were gushing from my lips like a Roman fountain. I finally downloaded everything I couldn’t get that damn printer to print on a flash drive, drove down to Kinko’s, and had everything printed in less than 30 minutes. In the months following the graduation, I felt myself pulling away from the HP. I was no longer willing to work on our relationship. If I encountered any resistance at all from that little nutcase, I took my flash drive and turned to Kinko’s. By the end of summer, HP and I were at an impasse. It basically wasn’t printing anything for me; meanwhile, my relationship with Kinko’s blossomed (and feeling the expense was worth every cent to my sanity). And then a wondrous thing happened. Not having me to kick around anymore, HP started messing with my husband. I began hearing a few swear words coming out of his mouth, and noticed that he was increasingly having problems printing. Now things were getting interesting! In September, we decided to get a new laptop for me, so we’d each have a laptop when we’re traveling, and my husband said something incredible. At least, I thought he said, “Maybe we’ll get you a small printer to go in your office.” I tried not to get too excited, as these initiatives take time to come to fruition in our house. Then that HP stupidly kept messing with my husband, and he began researching in earnest what might be wrong. What he discovered online was that an “update” pushed out by HP in the last few years basically destroyed some key part of the printer. That did it! Now he was angry! HP had just messed with the wrong guy. (A little slow, but glad he was now feeling my outrage.) He found a part on eBay that some claimed could be a DIY fix to the problem, which he ordered and it came last week, and then my heart sank. Now we might be in for another protracted period of “fixes” to that blasted HP. But, last Friday I came home to a huge empty cardboard shipping box sitting on our living room floor. I went into my den/office and there it was…my new Dell. It was love at first sight. The reign of HP oppression has ended. Since then, I’ve been printing to my heart’s content. Color! Two-sided! PDFs! Webpages! That document from graduation that HP never printed! Everything is done quickly, cheerfully and perfectly, with no attitude. I may even be able to print my Christmas letter myself this year. It all just makes me want to sing. I love my new printer. In the peculiar, lonely world of blogging, there is nothing like writing a good post that hits the mark in some way for someone else and then to hear about it. 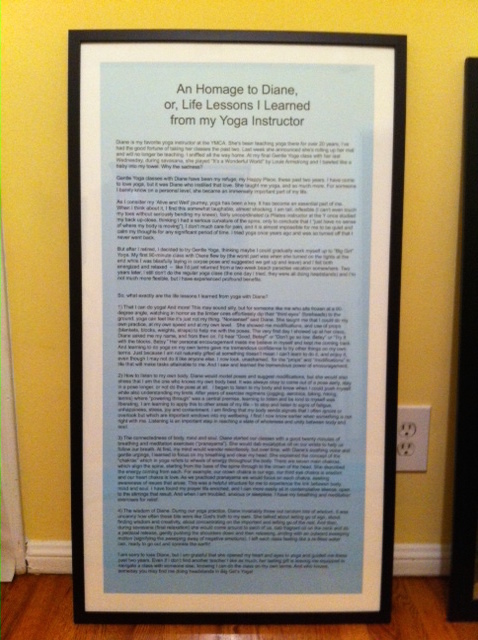 An incident that absolutely made my week was in connection with a recent post I wrote in tribute to my yoga teacher, Diane. After reading it, Diane wrote me a sweet note, delighted that I captured the essence of her teaching and expressing how much the post meant to her. Which utterly warmed my heart. Then, last week she sent me an email saying she loved the post so much she forwarded it to her husband to print on special paper, and HE was so impressed that he had it enlarged, printed and framed for her, and it is now hanging on the wall in their house. It just doesn’t get any better than that. The framed copy of my blog post in Diane’s house. Those glorious and infrequent moments aside, blogging is a rather odd experience. I easily think of countless potential topics each week (in fact, I often find myself viewing life events with an eye towards how they would play as blog posts) and just as easily discard most of them. I spend hours writing and re-writing my posts, sometimes composing in my sleep (I never write and post the same day as some of my best work happens in my subconscious). Then when I’m at least 95% satisfied with a post, after pouring my heart and soul into it, I press the Publish button, sending my latest fragile masterpiece, my recently birthed baby, careening into a cyber-universe of mostly complete strangers, asking them to read and judge my work. It is an odd, one-way, vulnerable, terrifying, intimidating, and exhilarating moment. I worry about over-sharing personal information and experiences. I worry about violating the privacy of my friends and family. I worry that an axe murderer will figure out where I live. After publishing, my posts are answered, for the most part, with a deafening quiet. I receive a few likes and comments, typically from a small, loyal, vocal and much appreciated core group of followers, but mostly radio silence (which I suppose is good when I think about that axe murderer). Or, another creepy aspect of blogging is that, more than a few times, I have been with friends or acquaintances who reference things about me that I am pretty sure they shouldn’t know. Then it suddenly hits me (it happens every time) that they’ve been secretly reading my blog (should I be flattered or not since they’ve never said anything? ), and that my life is a potentially unhealthy, semi-open book. So why DO I blog? “This, I believe, is the central question upon which all creative living hinges: Do you have the courage to bring forth the treasures that are hidden within you? I love the notion of “Big Magic” and it helps me understand the artistic drive. For me, writing is my Big Magic. I find that during the creative process, I grapple with experiences, discover things about myself and often come to surprising conclusions. Frequently, I will start writing a post, only to find it going in an entirely different direction than I anticipated. There is a deep satisfaction in finding the right combination of words that most fully captures my thoughts and emotions. It is the joy of finding my “buried treasure.” When Gilbert challenges us to have the courage to bring forth the treasures that are hidden within us, I think of the trepidation I feel each time I push the Publish button. Blogging makes the creative process frightening, invigorating and more rewarding by openly sharing my “strange jewels” and my personal journey of finding them. It took me awhile to understand that, notwithstanding the occasional Diane mutual admiration moments, my blogging is ultimately for myself. I quite simply love to write. I love to write about the random things that peak my interest. I enjoy the creative process and I push myself to produce the best writing I can. I take pride in the end product. I hope that others enjoy reading and experiencing my journey, but at the end of the day, I would be horribly disappointed if my ultimate goal was affirmation and recognition. I have to hit my own head with my own handmade wand and consider myself a legitimate writer. Blogging is largely a one-sided, lonely form of communication, but one that also carries an unexpectedly deep internal richness and connection with self. However, if there’s one thing I learned this week, as a writer (and I will strive to remember as a reader), it is that the occasional (and heartfelt) affirmation is treasured indeed! I haven’t had much time to write my blog posts, as I’ve been busy finding myself. As you may recall, I recently experienced the first “adjustment anxiety” of my fledgling retirement, triggered by the prospect of extended time at home with (horror!) nothing specific to do. That in turn sparked a flurry of activity designed to thrust myself into and through the next phase of retirement (the “re-orientation” phase) as quickly as humanly possible. Being the goal-oriented girl I am, my objective is to get to the “completely comfortable and enjoying retirement to the hilt” stage in record time. I am completely aware this may not be sound strategy and I may need to be patient and contemplative, but that’s not my strength and I can’t really help myself. So, this week found me in a state of manic self-discovery. I signed up for eight adult education classes over the next two months. The first, last Saturday, was a seminar entitled “What Were You Born to Do?” The second, a five-week series of golf lessons, began on Wednesday. 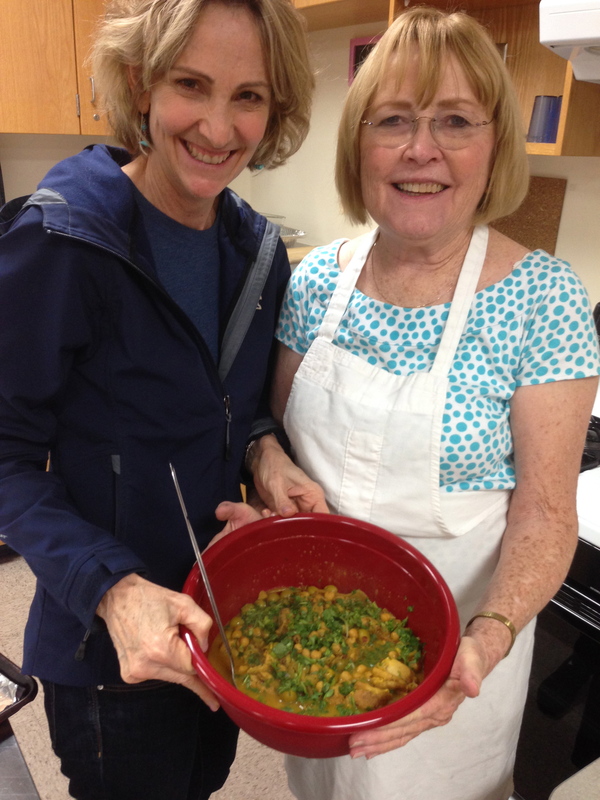 The third, a cooking class called “Winter Soups and Stews” was on Wednesday night. I also scheduled exercise classes every morning at the local YMCA (including two yoga classes, which is new for me). Last Saturday, before my adult education class, I met a friend at a Paint Your Own Pottery studio and painted a plate. On Monday, I drove an hour to visit my college roommate who was in town visiting her mother. On Tuesday, my husband and I had a dinner and theatre date with another couple. On Friday night, I have my monthly Book Club meeting. On Saturday morning, I’m driving to San Diego for the weekend to visit high school friends. I fully recognize the overexcited, Energizer Bunny quality of my life right now, and I don’t think I can or should keep this up forever, but it has been invigorating! 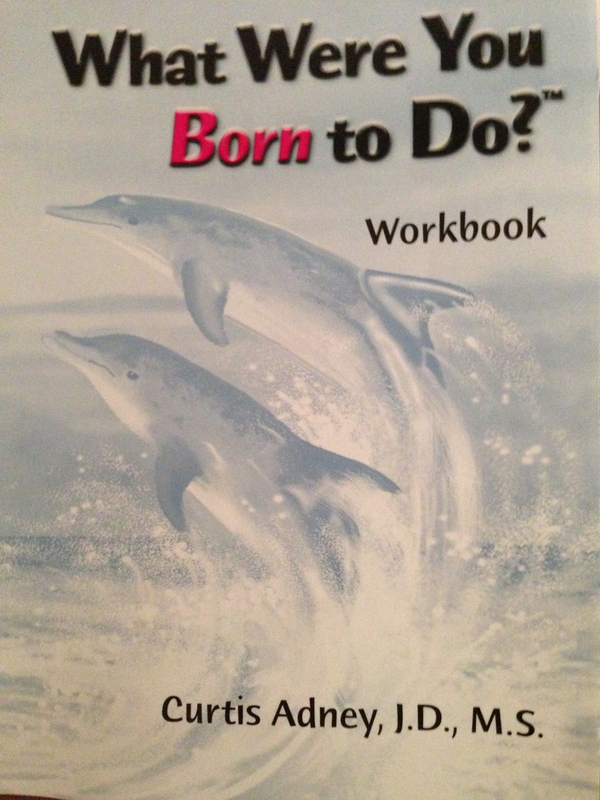 Getting back to the seminar on Saturday (“What Were You Born to Do?”), I was intrigued by the description in the class catalogue, but wary it might be crackpot. “You were born to make a unique contribution to humanity. Progressing toward this purpose brings joy and abundance. Straying from it causes stress and emptiness. To accomplish this mission one of the 33 Natural Talents is wired into your DNA. It’s so subtle, you rarely notice it; yet so powerful, it’s the source of your highest potential.” I was hoping my Natural Talent was something lucrative. The class proved to be surprisingly effective and energizing. The instructor, who reminded me of an older version of the Professor on Gilligan’s Island, began by describing his own life story and how his recurring dissatisfaction with the jobs he’d held had spurred intense self-analysis. This led to recognition of his own “Natural Talent” and its under-utilization. He eventually quit his job and began giving seminars, helping others to recognize their Natural Talents. He has fine-tuned the process and the list of Natural Talents through extensive research and working with “thousands” of people at the seminars he’s conducted over the past twenty years. During the course of the 3-1/2 hour class, through listening to descriptions of the Natural Talents, completing questionnaires and quizzes, class discussions, and reflection on my life and activities, recurring behaviors, likes and dislikes, I concluded that my Natural Talent fell under the general category of Creative Arts, and more specifically, Writing. During one class exercise, I recalled that some of my favorite activities as a young girl were reading, especially biographies of famous women; writing stories, letters and diaries; and making up elaborate stories regarding my dolls and other toys. I also remember winning writing contests, especially short story fiction. In college, unlike almost every other classmate I knew, I loved writing research papers. In law school, I made Law Review based on the strength of my “Comment” (a research paper on a topic never before published). In fact, I was named Law Review Comments Editor, and the next year edited others’ Comments. As I reflected on my favorite part of my business career, it was the writing – letters, presentations, reports – that I enjoyed the most, and it was always important to me to “tell the story” in my writing. And most recently, writing my blog since retiring has been a source of great satisfaction for me. The beautiful thing about retirement is that I no longer need to consider earnings potential when picking an activity. I would love to parlay writing into an enjoyable AND lucrative second career but there is no rush or imperative. In the meantime, I can dream about the possibilities. Novel? Humor? Travelogue? Researched nonfiction pieces on politics, or history? A biography? An expanded blog? All I can say is, now I’m down with the re-orientation phase!